Sage and Salesforce put on a love fest on Tuesday to announce their partnership in which Sage has developed Sage Life, a product to enable small companies to connect their “customer, accounting, payroll and finance data into one system, accessible from any device, anywhere,” according to the press release. The wording leaves it unclear if the customer data is held in Salesforce’s traditional CRM or if it refers more broadly to ERP data. Sage Life will be out later this year and will likely be shown to the public at Sage Summit, a user meeting in New Orleans in July. The shared press conference between CEOs Stephen Kelly of Sage and Marc Benioff, Salesforce, shed no new light on the continuing controversy over whether Salesforce was being pursued by a third party as an acquisition. For all we know Salesforce is or is not being pursued by an anonymous third party but certainly all of the likely contenders—i.e. vendors who can afford such an acquisition—have demurred when asked. The fireside chat was held at a restaurant not far from Salesforce headquarters in San Francisco. Even if this was not the acquisition announcement many had expected, it was still certainly a news-worthy event. Sage is the second largest software company in Europe behind only SAP and the vast majority of its customers—85% according to Kelly—are still users of on-premise computing solutions to run their small businesses. This should be seen as a significant opportunity for both companies. For Sage it is a significant upsell opportunity, albeit one that will go through its resellers. The danger for Sage is that its partners or customers will abandon the brand in favor of other cloud solutions such as NetSuite, FinancialForce, or other cloud solutions. On the other hand, Sage’s huge installed base represents a large community of potential users of Salesforce’s platform, Salesforce1 upon which Sage Life and any future products would be based. Kelly was careful to note that he regards Sage customers as customers for life and that he wants to be their supplier into the future. It was his way of telling them that while cloud computing is the future of the industry, Sage would not be twisting arms to get its customers to upgrade. This is both good business and fine logic because it will take time to educate and motivate Sage’s existing partners to make the switch. Still Sage Life offers many modernizations that Sage customers might gravitate towards such as its ability, thanks to Salesforce1 to integrate collaboration, social, and an array of other apps on a single handheld device. Significantly, Kelly said that the new application and its underpinnings is as important as the introduction of the iPhone for his customers. 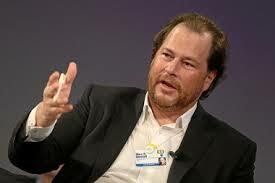 Benioff had no comment when asked about potential acquisition rumors, a position which he, as the CEO of a publicly traded company must take to keep from running afoul of the SEC and Justice Department. Nonetheless, Benioff’s demeanor and business casual dress suggested that this meeting would not produce the kind of news some had expected. When asked specifically about Microsoft, a company once rumored to be a suitor, Benioff praised CEO Satya Nadella as an, “Incredible partner,” for his openness and the mutual effort to get the two software giants working together over the last year. Benioff noted that Nadella’s Microsoft, is the “old Microsoft” that would reach out to software development partners to help them incorporate its products—such as office, Azure, Outlook—deep into their own to provide users with a well integrated experience. This is a posture that Nadella has taken with other software companies including NetSuite just last week in making a joint announcement during SuiteWorld. Some had seen this as a flirtation that would precede acquiring Salesforce but they were likely reading too much into the gesture. At the same time, there was no mention of a Salesforce purchase of a minority interest in Sage, from time to time Salesforce has taken a minority position in other software companies; but not today. Others, like me, had expected this to be part of the announcement. For the most part the Q&A centered around relatively safe topics such as the need to treat customers well, the powerful combination of Sage and Salesforce in the market, and Kelly’s coming effort to transition Sage’s business model to reflect the recurring revenue aspect of cloud and subscription models. It will be interesting to see if Sage Life is only the first of multiple cloud offerings based on the Salesforce1 Platform, or a one off. A lot depends on being able to convince partners that the time to get to the cloud is here, even for them. Failure is not an option for this transition and if the current partner base fails to seize the moment, Sage may have to consider either new recruits or a different business model. Some of the drama over the rumored acquisition of Salesforce.com by a larger software industry rival could come to a head today when Salesforce CEO Marc Benioff and his Sage counterpart, Stephen Kelly, share a joint press conference in San Francisco. For weeks the rumor that Salesforce was being courted have been fueled by speculation in the financial press about Salesforce’s apparent engagement with investment bankers. The speculation was that it was figuring out how to deal with an unsolicited offer but all along I have felt that the signals were not very strong and that a Sage deal made more sense. I think Salesforce will take a minority position in Sage, in part as a good will gesture. There was plenty of evidence if you knew where to look. Salesforce and Sage had made a joint announcement in the first quarter about Sage porting some of its accounting software to the Salesforce1 Platform and becoming a member of the Salesforce ecosystem. The existence of the press conference, being billed as a fireside chat, and the general plan, has also been known for two weeks. On the other hand, the rumormongers failed to produce any solid evidence about who an acquirer might be and relied on hearsay and unnamed sources to build its case. The thing that tips the balance against the rumors for me is that so much that has gone on has been done behind closed doors. In a takeover attempt you normally see a lot of posturing and negotiating in public. Recall the spectacle when Larry Ellison’s Oracle decided to buy PeopleSoft and Siebel. Now, those were acquisitions! We will know in a few hours, or not. Just as a paranoid might have real enemies, Salesforce could still be being pursued. But, if Salesforce were to invest in a piece of Sage, it would complicate the calculations of its valuation and could tip the balance against acquisition. I suppose you could view this as a form of poison pill. Well, how about them apples? In a Reuters article out today, Microsoft said it wasn’t really pursuing Salesforce at this time citing the high cost—about $50 billion for the market cap and what must be calculated for a premium likely to be extracted from any would-be suitor. As I have been saying, the time when Salesforce would have been a smart acquisition has long passed. When conditions were right for a purchase, the very shrewd people running software companies poo-pooed the whole idea of cloud computing and were not interested. Now, despite some credible efforts at building cloud infrastructures, these same companies have been disrupted. The same Reuters article quotes Chief Executive Bill McDermott of SAP declining interest too, saying, “We have never bought something that was impaired and in decline.” Clearly implying that Salesforce’s cloud computing software was becoming commoditized—as if legacy on-premise software is still in its hay day. What cheek. McDermott can only wish his company was as impaired and declining as rapidly as Salesforce. What exactly does impaired mean anyhow? Is it a new GAAP standard? Related posts here, here, here, and here. Sage and Salesforce: Odd Couple Alliance? I have been expecting this announcement for a long time but it still came as a surprise when Keith Block, vice chairman Salesforce, made an off the cuff remark in Boston at the Salesforce World Tour event last week. In February Sage and Salesforce announced that they’d work together with Sage moving some of its undisclosed ERP applications to the Salesforce Cloud. But the word didn’t seem to spread and it remained off my radar for nearly two months. No matter. Sage has been a mainstay of the SMB market for business apps for a long time. With global reach and customers that push the envelope for what an SMB is, the company enjoyed great success in prior decades. But lately, the company’s legacy has been a drag. The apps have needed refreshing for a while with some of them still operating on flat file system back-ends rather than relational databases. The major culprit, from my perspective, has always been the Sage resellers. The partners have built great businesses on delivering services for customizing and training for Sage products and were reluctant to change their cash cow businesses. A succession of weak CEOs didn’t help much either. Several thought they could ignore the problem of modernization or cajole partners into adapting with the backfiring result that the forward thinkers abandoned ship leaving the more conservative partners with increasing influence. This is my analysis and you should look for confirmation but my point is that we have arrived at a time when Sage is getting off the dime by getting onto the Salesforce1 Platform and with it joining the ecosystem. This is great news but it also has its own issues for competitiveness. Although Salesforce CEO and co-founder Marc Benioff long ago disavowed any interest in building an ERP product, the availability of the platform has been more than inducement enough to get others to do so. Companies like FinancialForce, Intact, and Kenandy and others all have products on the AppExchange that will compete in one way or another with anything that Sage brings to the party. Also, there’s no shortage of non-Salesforce oriented ERP in the cloud happy to do battle with NetSuite being the 800-pound gorilla. But Sage still has a big user community around the world, products that reach smaller users than those that other ERP/accounting vendors target, not to mention a partner base that can still deliver so it will be Sage’s relationships, I think, that either make or break this move. Also, being able to show up with the world’s number one CRM in tow and a slew of modern business apps to boot, should make a powerful combination. Just ask the other ERP players. It is still unclear which Sage products will be converted or which ones first. I hope that the company will see this as an opportunity to move everything so that for the first time, the product lines that grew by acquisition, will have a common platform. This is a big test both for Salesforce and for Sage. For Salesforce it’s a great way to grow share and gain influence in more parts of the world. For Sage, it represents a chance at redemption and a new start as a more integrated software company with deep expertise in the back office and multiple verticals such as real estate. In my mind this doesn’t leave much room for a Sage CRM product though. They had three CRM solutions at one point including ACT! And SalesLogix that they sold off. Sage is now left with a cloud product that by all accounts is good but Sage has always been a company by and for accountants and front office automation was never something the company put its back into. I can name other vendors that were in the same situation but who for multiple reasons became CRM oriented enough to talk the talk, so can you. Sage Summit happens this summer and it should offer some very interesting keynotes. Will a Salesforce executive attend to welcome the company to the cloud? To be continued. Holy moly Salesforce announced they were buying ExactTarget for a cool $2.5 billion this morning. The deal will do much to complete CEO Marc Benioff’s vision of a MarketingCloud to go along with the SalesCloud and ServiceCloud of the company’s core CRM suite. Some would say the Salesforce and the entire CRM suite vendor corps have been late to the market in developing a robust marketing solution and I would be one of them. However, it needs to be said that the vendor community played things well by a lot of measures. For the last five years with a depressed economy it was natural to concentrate on service since the name of the game in a slowdown is to protect your core business. That’s what a lot of CRM vendors did, they beefed up their service and support offerings building in elaborate social architectures that enable their customers to service their customers effectively and at lower costs than previous modalities. Fast forward to this year and the economy is picking up steam and that means a more traditional approach to gaining new customers and an emphasis on sales and marketing. Sales we know had been the bread and butter of CRM so it was logical for the vendor community to go after marketing. For years, marketing has languished as the largely independent stepchild of CRM. Marketing is widely acknowledged to be CRM but its business processes are very different from service and sales and for that reason many vendors always put off building robust marketing functionality into their CRM suites. Instead, marketing has remained independent with companies like Eloqua and Marketo running their own shows. But Eloqua was recently bought by Oracle and Marketo had an IPO just a few weeks ago, Pardot was bought by ExactTarget, which I think made the acquisition much more attractive for Salesforce. However, I see some yellow flags waving on this deal. First off, $2.5 billion bucks can buy a lot of development talent (and a good weekend in Vegas). This is an expensive deal and I wonder why Salesforce didn’t want to build the solution itself. They seem to prefer buying over building these days and while I can understand buying for strategic reasons, I have a hard time when I see making a purchase as the default position. And, speaking of acquisitions, the buzz around the industry I had been hearing was about how long Salesforce would let Marketo wander around without taking them off the street. Guess we know now. Secondly, there appears to be a fair amount of overlap between ExactTarget and Salesforce especially in the analytics arena. If you back the analytics components out of the deal, then you have to ask how much more development there would have been to build something that was Salesforce native. None of that matters now; the deal is done and except for the price tag (I am a flinty, tight fisted New Englander after all) there is a lot to like about the combination. Instantly Salesforce gets 6000 ExactTarget customers but then again many of them are already Salesforce customers too. The combination also comes with serious marketing chops given that Gartner gave ExactTarget high marks in its recent Magic Quadrant. I think the companies this affects most are SAP, Microsoft and Sage — add in NetSuite too. With Eloqua and now ExactTarget in enemy encampments there are fewer marketing options for these companies. This could make Marketo the bell of the ball for these vendors though right now Marketo is well tuned to being in the Salesforce ecosystem but it is not exclusive to be sure. So maybe Marketo walks out of this with a clearer landscape and more market power. At any rate, it will take a few months for the dust to settle but ExactTarget is already in the market and executing with Salesforce customers so for the most part it’s game on.